It is believed that central Mexico has been inhabited for thousands of years, but Mexico City history really begins in 1325AD. In recent memory before 1325, the area was actually covered by a lake, Lake Texcoco. But an incredible transformation was about to take place, launching Mexico City history in a way few would have expected. It seemed like an unlikely place for a city. Not only was the island small and difficult to access, the lake itself was salty. But the Mexicas knew how to make the best out of a seemingly bad situation. Soon causeways were built leading to the city, making it accessible to merchants and travellers but easy to defend in case of an attack. Aqueducts were built, providing the city with fresh water. A system of agriculture developed, making the area extremely fruitful and efficient, providing the city with food. As the city was built, roadways grew up and parts of the lake were filled in. Tenochtitlan was to become the "Venice of the New World", a series of canals, city and farmland, well planned, equal or better than any city in the world. In this early Mexico City history, Tenochtitlan immediately became the centre of a growing empire. The Mexicas developed alliances with other cities, got tribute from other peoples, and ruled throughout central Mexico. The city became a major centre for trade, military operations, culture, and political power. Hernan Cortes from Spain arrived with his army in 1519, and in two years after a 79 day siege had captured Tenochtitan. The old Aztec city was mostly destroyed, and was rebuilt by 1525. It should be noted, however, that this was not simply a brand new city. Much of the Aztec culture and layout, and of course many of the people, remained the same. To understand Mexico City history, it's important to remember that it's not so easy to wipe out an empire. Just as the Aztec way of life had grown from the many cultures before it, so the new Mexico City, even the one we know today, is still in part the ancient city of Tenochtitlan. Mexico City was still the centre of culture and power in Mexico. It was also where places as far as Cuba, Florida and even the Philippines were administered. No doubt Cortes had recognized the importance of the city, and continued its tradition of power. Mexico City history continues to be a history of power and influence. As the powers in Mexico changed over the years, each left their influence. In 1821 the country gained its independence from Spain, though of course the Spanish influence and many people of Spanish descent remained. French intervention in Mexico left remnants of a French culture in the city. The US invasion in 1847 added its marks of tragedy and heroism. In 1910 came the Mexican Revolution. The cultural and political currents would last throughout the century. The next few decades would be a time of massive immigration into the city. The influx of people would make Mexico City one of the largest cities in the world, as it is today. From its hosting of the Olympics in 1968, to the FIFA World Cup in 1986 (after its remarkable recovery from the earthquake of 1985), to its fast growth in the 1990s, Mexico City's history continues to be one of tragedy and triumph. As Mexico City history has been coloured with power and influence, so the city today continues to be a cultural and political centre. As one of the world's largest cities, it continues to be blessed and plagued with all the benefits and problems of large cities. 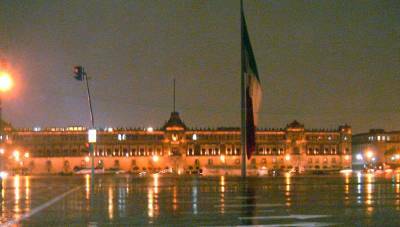 Today, Mexico City is known as the Ciudad de los Palacios or City of Palaces. Each era of Mexico City history has left its monuments, palaces and places of worship, and the people of Mexico are quick to remember, to maintain their monuments, restore old architecture, and build new places to be remembered in the future. Read this article from worldfacts.us for Mexico City history from a tourist point of view. 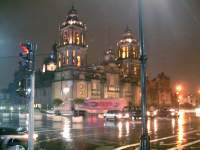 For more about ancient Mexico City and Central Mexico, try this article from MexicoCity.com.mx.